Andy Murray chose to miss Britain's Davis Cup tie in April against Russia because he believes he can win his second major title at the French Open. The US Open champion, 25, will focus on preparing for the clay-court season while Britain play in Coventry. 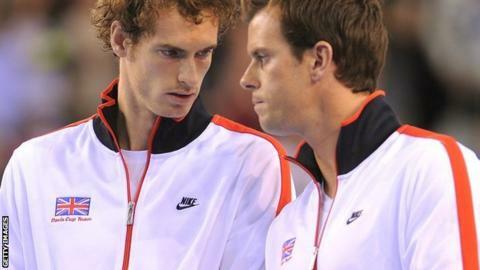 Murray said he will be available for Britain's next Davis Cup tie in September. "I believe I have a chance of winning the French Open," said Murray. "But to do that I need to prepare and use every single day as best as I can." Murray has made the semi-finals of the French Open in the past, and with seven-time champion Rafael Nadal only just ready to return from a long injury lay-off, the Scot will be among the favourites this time. "The clay-court season is extremely important for me," said Murray, who was speaking at Queen's Club where he confirmed he will return to the Aegon Championships in June. "It's a surface that takes me a long time to get used to, it's not a surface that comes naturally to me. Grass and hard courts I feel comfortable on fairly quickly, the clay takes me a long time. "I need to practise and train on that for a lot of hours. It's a surface where I had problems with my back last year and I had to take a pretty solid amount of time off during that season." Murray lost to Novak Djokovic in the Australian Open final on 27 January, and admitted that his lengthy semi-final win over Roger Federer might have had an effect on his chances in the final. "Obviously there were a few things I could have done a little bit better in the final, also the semi-final as well," he said. "I maybe could have made it easier on myself and not had a long five-setter - I had the chance to serve for the match in the fourth set, didn't play a particularly good tie-breaker after that, so they're the sorts of things you think about and look at. "But I played well overall, it was a good tournament." Murray preparations take him to Miami next for a block of training and has chosen not to play between now and the Masters events in Indian Wells and Miami on 7 and 20 March respectively. "I've realised over the years that I play my best when I have time to prepare for each tournament as best as possible," he said. "That's why I'm not going to play anything between Indian Wells and Miami."